Club Penguin Cheats by Mimo777 Club Penguin Cheats by Mimo777: New Club Penguin Sensei Toy now Available! COOL! I love the whole Club Penguin Ninja thing. I think it is one of the better things that Club Penguin has ever done. Now you can buy the Club Penguin Sensei Toy! Check it! Also, you can now buy Club Penguin Toys are Target! Anyone up for a Quickee Party today?! whoa! major awsome! i actually came here to add your banners to my blog! could someone plz visit it? im so lonely... Keep on Wadell-ing! AWESOME!!! That's really cool! I was about to tell you! Have you ever thought of have a major blowout party every weekend? we should have a party! todays homework day... ugh so lets spice it up!! cool! i go to targret ALL da time! Sure Ill check it! What's it called? I have an idea for a contest. It is a translating contest. We have to pick any fairytale that Mimoo allows, and we have to translate it into Poortguese, French or Spanish. (If you are fluent in any of those it is excluded and you add another one. Mmo decides which one is the best (longest, best translated or easiest to read.) The winner gets a Club Penguin membership. Have you ever thought of have a major blowout party very weekend? Yeah I do. Make 3 and 2 on cp please. Mimo, i already knew about this. Lux1200 or whatever his name is posted about it. He sold the codes of eBay. P.S. I already got the toys. i know my sis calls him granpa al lol! clubpenguin toys at Target saaweet! yep thats where i get mine they dont have the mix and match things though. sweet! does anyone know where to buy card jistu cards. Ive looked everywhere! yes now i can buy them at target! Yay! Now I dont have to go to toys r us and walk around the girly stuff to get to the cp toys! Mimo, in addition to the Sensei plush, Club Penguin has added some other toys. There's a Frankenpenguin, Fairy, Fish, Pirate, Ninja, and a Mad Scientist. There's also some new Mix and Match figures. You can check it out at the Club Penguin online store. You can post this on your site, just make sure you give me credit! Cool I really want one!And Mimo?Are you gonna have another quickee party! i never got to go to one! =0( Im always to late!Plaese tell me before when your having one!id really like to go!-Cute Morgie (Thats My CP User! )P.S Hope your grandpa gets well soon!I wish him the best of luck! whats the card look like? Toys R Us has them, or most of them do anyways. You can also buy them online. AGREED!!!!! they haven't had a new mission in AGES! but, I do like the toys. I hope they get sensei over to New Zealand! 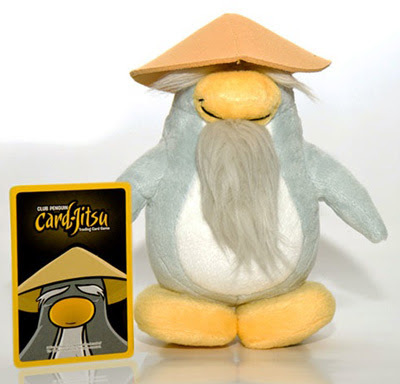 (thats where I live) They have only just got the card jitsu cards over here. I GOT THE SENSEI TOY!!! woh the next club penguin toy I get is going to be sensei toy. P.S. I noticed that nothing much is happening in club penguin right now i'm so bored lol. awesome toy! i love it! Im frm australia and we have also got CP toys! i was so happy when i saw them! they also have cp toys in k-mart down here, do u have k-mart up there? There is also a ninja penguin. Hey Penguins and Online Gamers This is Dsc(And some numbers)From cp. Just wanted to say Waddle Waddle Waddle On CLUB PENGUIN! thats kool but i think my cuzin would like this better than i do BUT I LUV CLUBPENGUIN!!!!!!!!! Cool, I can get 'em at Target now! Toys R Us was all across town. Awesome!